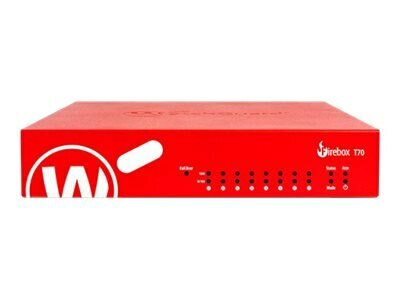 The WatchGuard Firebox T70 is the only tabletop appliance available today that provides full UTM protection at over 1 Gbps, and is ideal for SMB and distributed enterprise networks. With these industry-leading tabletop speeds, the WatchGuard T70 is the only tabletop appliance that can keep up with fiber broadband speeds. The WatchGuard T70 also includes 2 Power over Ethernet (PoE) ports to power peripheral devices such as access points and security cameras, allowing administrators to extend the reach of their networks without having to run costly AC power to remote devices. The WatchGuard Firebox T70 is a fast performing tabletop. The T70 is the tabletop appliance that is capable of running full UTM services at over 1 Gigabit per second, enabling you to keep up with lightning-fast fiber broadband speeds. Even today's environment of heavy HTTPS traffic isn't enough to stop the T70, so network users and admins can rest assured that they are getting the full benefit of all of WatchGuard's security services that are designed to break the kill chain of malware. WatchGuard RapidDeploy takes the delay out of the firewall deployment process. The innovative, cloud-based configuration capabilities allow WatchGuard firewalls and UTM solutions to securely configure themselves. IT staff can create and store configuration data in the cloud - public or private - and have the appliance directly shipped to its destination. Once the device arrives, it effectively deploys itself by automatically connecting to the cloud for a secure download of its configuration settings, saving your staff time and money. T70 also includes two Power over Ethernet (PoE) ports to power peripheral devices such as wireless access points and security cameras, allowing administrators to extend the reach of their networks without having to run costly AC power to remote devices. PoE ports aren't often found on tabletop appliances, making this a unique appliance for SMBs and distributed enterprise organizations.